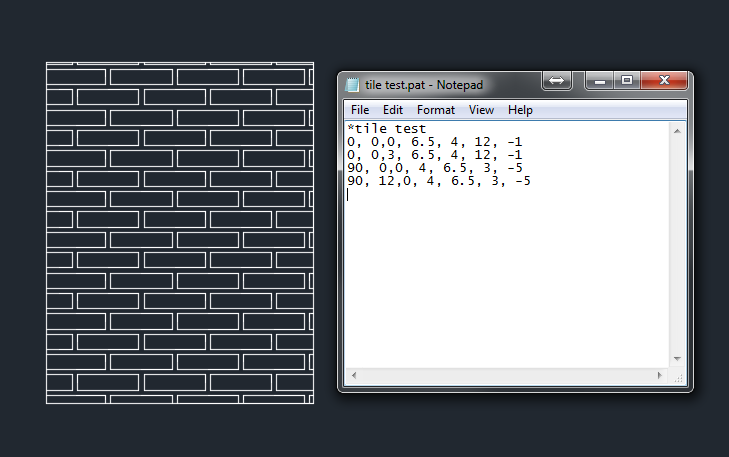 How to create new custom hatch patterns in AutoCAD and where to save them for use. AutoCAD comes with a large variety of patterns, but you can also create your own. You must leave an empty row after the end of the last line of the hatch definition. The description is optional; if you include one, precede it with a comma. Add the dash specifications only for noncontinuous lines. You can have more than one definition line (the second line in the syntax above). Each definition line can be no more than 80 characters. You can include a maximum of six dash specifications (which include spaces and dots). You can add spaces in the definition lines for readability. Angle - defines the angle lines in the hatch pattern. X-origin - Specifies the X coordinate of the base point of the hatch pattern. Y-origin - Specifies the Y coordinate of the base point of the hatch pattern. Delta-x - Specifies the offset of successive lines. This applies only to dashed lines and is measured along the direction of the lines. Delta-y - Specifies the distance between lines, measured perpendicular to the direction of the lines. This applies to both continuous and dashed lines. Dash - defines a noncontinuous line using the same system as linetype definitions: positive for a dash, negative for a space, and 0 for a dot.